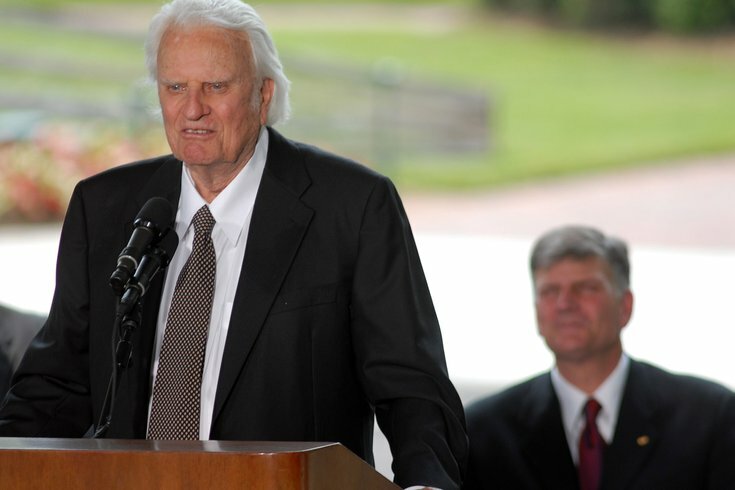 Billy Graham speaks at the dedication ceremony for the Billy Graham Library in Charlotte, North Carolina in 2007. Graham, who held crusades in Philadelphia in 1961 and 1992, died on Wednesday, Feb. 21, 2018. Graham was 99 years old. The Rev. Billy Graham, an American spiritual icon and activist for decades, died on Wednesday at the age of 99. He had been suffering from cancer, pnuemonia and other ailments and passed away at his home in North Carolina, a spokesman told the Associated Press. During his life, Graham conducted evangelistic campaigns, called crusades, across the United States and in more than 185 countries, regularly speaking to thousands of followers at a time. Two of those crusades took place in Philadelphia, in 1961 and 1992. During second visit to the city, the worlds of sports and religion collided. Graham spoke to more than 200,000 followers during five nights of preaching at Veterans Stadium in South Philly, delivering his classic sermon "Hope for Broken Things." Philadelphia Eagles defensive end Reggie White, an ordained minister, had been invited to speak to the crowd on June 25, 1992. Moments before he stepped to the stage to address the thousands in the seats at The Vet, White learned his teammate, Eagles defensive end Jerome Brown, had died in a car crash. Brown had been driving in Florida when he lost control of his Corvette on wet pavement, skidded into a palm tree and flipped his vehicle. White, crying, broke the news of Brown's death to those in the stadium, who let out an audible gasp. "All the stuff you heard about Jerome Brown, and the stories said about him ... this man was one of the greatest people I ever met and knew in my life," White said.